Twitter’s Trending Topics can be confusing. You might have no idea that #NYFW means New York Fashion Week. So today it’s replacing the Discover tab with an enhanced Trends section that includes brief descriptions of what each trending topic is about. For now it’s available to U.S. users in English who have Tailored Trends turned on, but Twitter is experimenting on the web and plans to roll it out to more countries. These explanations are similar to the descriptions Facebook included when it launched its version of Twitter’s Trending Topics in January 2014. By giving people context, Twitter could make its product more accessible to the masses, aiding growth, and get more people participating in trends. For example, you might see Phantom 3 and have no idea what the topic is about. But now Twitter will tell you that “The World’s Largest Drone Company Unveils Newest Product DJI Phantom 3”. 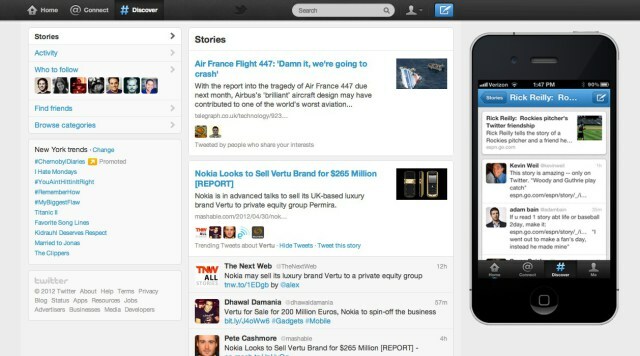 Previously, Discover was its own tab in the Twitter bottom navigation bar. Now that tab has been eliminated, and the new Trends with descriptions will appear when you tap the search icon atop the screen. Tapping into one of the trends will show you top tweets about the topic, media, tweets by people you follow, and then a wider breadth of posts mentioning the topic. Twitter introduced Discover in 2011, but it was always sort of an awkward feature, trying to cobble together top new stories, tweets from your network, trends, events, and more over the years. With the acquisition of Summify, it tried to make the section more personalized. Still, it always a back alley of Twitter, with content that felt outdated compared to the real-time stream. Replacing Discover with the enhanced Trends will give users a better way to see the most important things happening on Twitter, which was probably the intention of Discover all along.